The tech sector had its worst day in seven years, leading the Dow to its worst day in eight months. "People are getting out of the high-flying tech names right now," says Larry Benedict, CEO of The Opportunistic Trader. "I think people are under-hedged; there could be more pain ahead." Stocks sank on Wednesday as a steep decline in tech shares and worries of rapidly rising rates sent Wall Street on pace for its worst day in eight months. 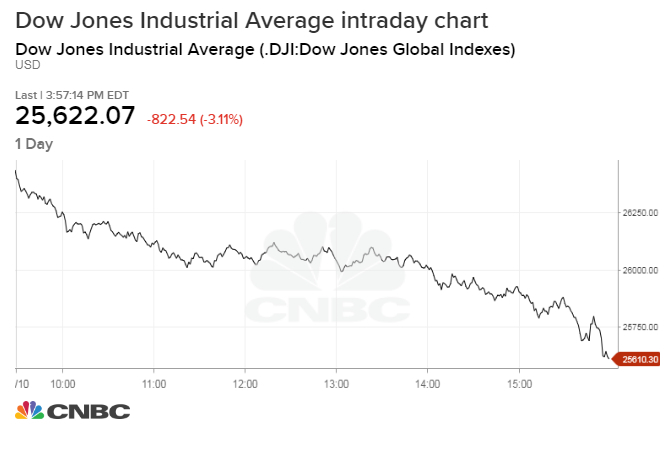 The Dow Jones Industrial Average closed 831.83 points lower at 25,598.74 as Intel and Microsoft fell more than 3.5 percent each. The Nasdaq Composite plummeted 4 percent to 7,422.05. The Dow also closed near its lows of the day. The S&P 500 dropped 3.3 percent to 2,785.68, with the tech sector underperforming. The broad index also posted a five-day losing streak — its longest since November 2016 — and fell below its 50-day and 100-day moving averages, widely followed technical levels. 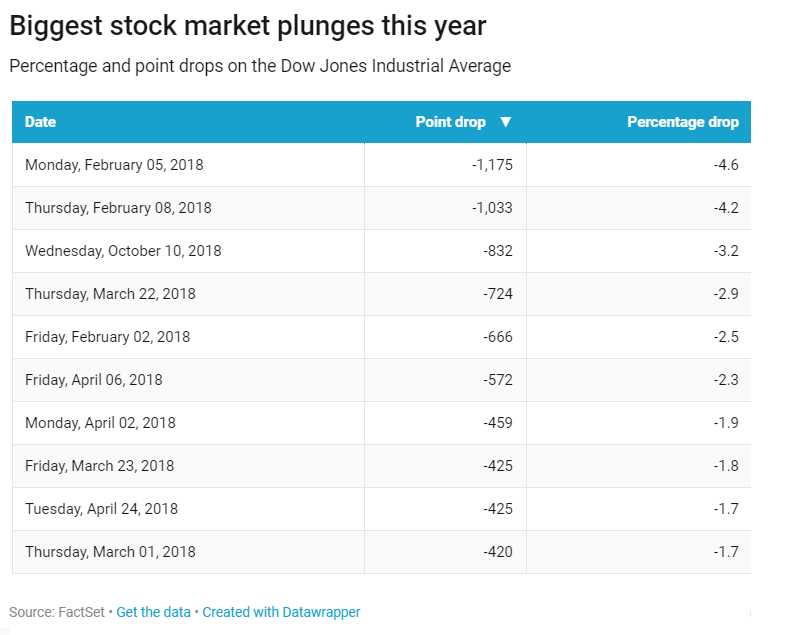 Both the Dow and S&P 500 posted their biggest one-day drops since early February, while the Nasdaq notched its largest single day sell-off since June 24, 2016. Rising rate fears and a pivot out of technology stocks have made it a rough last few days. The Dow has dropped four of the last five sessions. Shares of Amazon declined 6.2 percent on Wednesday, while Netflix slid 8.4 percent. Facebook and Apple also fell more than 4 percent each. These stocks are top performers for the year and for most of the bull market. For the overall tech sector in the S&P 500, it was the worst day in seven years, dropping 4.8 percent. "People are getting out of the high-flying tech names right now," said Larry Benedict, CEO of The Opportunistic Trader. "I think people are under-hedged; there could be more pain ahead." Worries about a sharp rise in interest rates also pressured equities. The 10-year Treasury note yield traded around 3.23 percent a day after hitting its highest level since 2011. The two-year yield, meanwhile, reached its highest mark since 2008. The speedy rise in yields has sent worries through Wall Street that higher borrowing costs will slow down the economy. "Portfolio managers tend to move to the sidelines in a skittish tape out of fear of suffering from a quick and sharp pullback," said Jeremy Klein, chief market strategist at FBN Securities. "The fundamental environment, though, remains supportive of share appreciation. I contend that the concerns of rising interest rates are largely overblown. Specifically, I do not anticipate much more of an increase in longer dated Treasury yields," he said. Rates rose on Wednesday after the U.S. government released data showing a rebound in producer prices last month. The producer price index rose 0.2 percent in September and is up 2.8 percent on a year-over-year basis. The index is a widely followed metric of inflation. The recent rise in rates comes ahead of the start of the latest earnings season. Banks such as Citigroup and Wells Fargo are scheduled to report later this week. Overall, analysts polled by FactSet expect third-quarter earnings to have risen by 19 percent on a year-over-year basis. But "there are just too many concerns about the rise in input costs," said Art Hogan, chief market strategist at B. Riley FBR. "Ongoing concerns about the stronger dollar and trade are being input into corporate guidance, and that is not good." "This goes back to the assumption that the market made wrongly ... that once we got NAFTA 2.0 done, we'd pivot to China," he said. But "the rhetoric on China has only gotten worse, not better." Stocks also fell as their European counterparts dropped on worries over Italy's budget. The Stoxx 600 index fell 1.6 percent, while the German Dax dropped 2.2 percent. France's CAC 40, meanwhile, pulled back 2.1 percent. — CNBC's Alexandra Gibbs contributed to this report.